Scottish Coats of Arms are granted and registered by The Court of the Lord Lyon. A Coat of Arms does not belong to a clan or family, it belongs only to its registered owner. Only the owner may legally use the Coat of Arms. Members of a clan should use the Clan Crest instead of the Chief's Coat Of Arms. A Clan Crest is usually the crest of the Clan Chief, surrounded by a belt and buckle that signifies alligance to the Chief. More information may be found on The Court of the Lord Lyon website. Some of the Coats of Arms belonging to members of Clan Maclean are below. These are generally registered to Chiefs and Chieftans of Clan Maclean, although others may apply for a Coat of Arms as well. Most of the following was taken directly from "Renaissance of the Clan MacLean" by J. P. MacLean. If you have any information on Coats of Arms that are missing, please email the webmaster. Click on any picture for a larger image in a new window. The Duart Coat of Arms belongs to the Chief of Clan Maclean. Ensigns Armorial viz: Quarterly first Argent a rock Gules; second Argent, a dexter hand Fesswise couped Gules, holding a crosslet fitche in pale Azure; Third Argent, a lymphad oars in Saltire Sails furled Sable flagged Gules; fourth Argent; a salmon naiant proper in chief two eagles heads erased respectant Gules. Above the shield is placed a helmet befitting his degree with a Mantling Gules doubled Argent and on a wreath of his liveries is set for Crest a tower embattled Argent and in an Escrol over the same this Motto, "Virture Mine Honour" and on a compartment below the shield are placed for Supporters on the dexter a seal proper and on the Sinister on Ostrich with a horse shoe in its beak proper. Coll Coat of Arms. Ensigns Armorial viz: Quarterly, first Or, a hill rising from the base Vert, second Argent, a dexter hand and arm issuant from the Sinsiter in fess Gules; and holding a cross, crosslet fitched in pale Azure; third Argent a galley her oars erect in Saltyr, Sails furled Sable and flags displayed Gules; fourth per fess Or and azure in chief two hawks heads couped and affrontic Gules in base a Salmon naiant proper, Crest a battle axe erect in pale crossed by a branch of Laurel and Cypress in Saltyr all proper, Motto "Altera Merces" and on a compartment below the shield (whereon are the words VIRTUS DURISSIMA FERIT) are placed for Supporters on the Dexter side a greyhound proper collared and leashed Guiles, and on the Sinister an Ostrich proper in its beak a horse shoe azure. Ardgour Coat of Arms. Ensigns Armorial viz: Quarterly first Argent, a lion rampant Gules, armed and langued Azure; second Azure a Castle triple towered Argent masoned Sable windows portcullis and flags Gules, third Or a dexter hand couped fesswise Gules holding a cross crosslet, fitchie Azure; fourth Or, a galley sails furled oars in Saltire Sable, flagged Gules in a sea in base Vert a salmon Argent: Above the shiend is placed a helmet befitting his degree with a Mantling Gules doubled Argent and on a wreath of his liveries is set for Crest, a branch of laurel and of Cypress in Saltire surmounted of a battle axe in pale all proper, and in an Escrol over the same this Motto, "Altera Merces". Dochgarroch Coat of Arms. Ensigns Armorial viz: Parted per Fess Or and Azure in dexter chief a dexter hand appaumee Gules and in Sinsiter chief a galley sails furled oars in Saltire Sable and in base a Castle triple towered Argent masoned of the fourth, windows and portcullis of the third: Above the Shield is placed a helmet befitting his degree with a Mantling Azure doubled Or, and on a wreath of his liveries is set for Crest a battle axe erect in pale between a branch of laurel and another of Cypress all proper and in an Escrol over the same this Motto: "Vinceri Vel Mori& and in Escrol below the shield this Motto "Virture Mine Honour" (The Dochgarroch Arms as given here shows his arms impaling those of his wifes 3 pheons Or (Nichols of Yokelton Salop) these are not in arms as registered). Drimnin Coat of Arms. Ensigns Armorial viz: Quarterly first Argent a rock Gules, second Argent a dexter hand fesswise couped Gules holding a cross crosslet fitchie in pale Azure; third Or a lyphad oars in Saltire sails furled Sable flagged Gules; fourth Argent a salmon naiant proper, in chief two eagles heads erased respectant Gules, all within a bordure engrailed Gules. Above the shield is placed a helmet befitting his degree with a Mantling Gules doubled Argent and on a wreath of his liveries is set for Crest a branch of laurel and another of cypress in Satire surrounded of a battle axe erect in pale all proper and in an Escrol over the same this Motto, "Altera Merces". Plantation Coat of Arms. Ensigns Armorial viz: Quarterly first Argent on a rock proper a tower Sable, masoned of the first windows and portculles Gules: second Argent a dexter hand fesswise couped at wrist grasping a cross crosslet fitchie in pale Gules; third Or, a galley oars in Saitire, Sails furled Sable, flagged Gules; fourth Vert a salmon naiant proper and in a base sea undy Argent and Azure; Above the shield is placed a helmet befitting his degree with a Mantling Gules doubled Argent and on a wreath of his liveries is set for Crest a branch of laurel and another of Crowberry heath in saltire, surmounted of a battle axe erect in pale all proper and in an Escrol over the same this Motto, "Fortiter et Strenue". Lehir & Ross Coat of Arms. Ensigns Armorial viz: Quarterly first Argent a rock Gules, second Argent a dexter hand fesswise couped Gules holding a cross crosslet fitchie Azure; third Or a lymphad oars in Saltire sails furled Sable, flagged Gules; fourth Argent a salmon naiant proper in chief two eagles heads erased respectant Gules; over a helmet befitting his degree with a Mantling Gules doubled Argent and on a wreath of his liveries is set for Crest a battle axe erect in pale between a branch of laurel and another of Cypress all proper and in Escrol over the same this Motto, "Virture Mine Honour". Lehir & Ross Coat of Arms (Breda). Ensigns Armorial viz: Quarterly first Argent a rock Gules; second Argent a dexter hand fesswise couped Gules holding a cross crosslet fitchie Azure; third Or a lymphad oars in Saltire Sails furled Sable flagged Gules; fourth Argent a salmon naiant proper in chief two eagles heads erased respectant Gules; over all a cross Azure dividing the Quarters, a crescent Argent for difference. Above the shield is placed a helmet befitting his degree with a Mantling Gules doubled Argent and on a wreath of his liveries is set for Crest a battle axe erect in pale between a branch of laurel and another of cypress all proper and in an Escrol over the same this Motto, "Virture Mine Honour". Drimnacross Coat of Arms. Ensigns Armorial viz: Quarterly first Or: a hill rising from the base Vert, second Argent a dexter arm issuing from the sinister fess Gules holding a cross crosslet fitchie in pale Azure; third Argent a galley, her ores erect in Saltire and sails furled Sable flagged Gules; fourth per fess Or and Azure, in chief two hawks heads erased respectant Gules, and in base a Salmon naiant proper; all within a bordure engrailed and quarterly Gules and Vert: Above the shield is placed a helmet befitting his degree with a Mantling doubled Or and on a wreath of his liveries is set for crest, a battle axe erect in pale crossed by a branch of laurel and another of cypress in Saltire all proper and in an Escrol over the same the Motto, "Altera Merces". Tiree Coat of Arms. Ensigns Armorial viz: Quarterly first Argent a lion rampant Gules armed and langued Azure, second Azure a Castle triple towered Argent, masoned Sable, third Argent a galley, sails furled, oars saltire Sable, flagged Gules; fourth, Vert a Salmon naiant Argent, all within a bordure invected Gules charged with three Crescents Or: above the shield is placed a helmet befitting his degree with a Mantling Gules doubled Argent and on a wreath of his liveries is placed for Crest a battle axe erect in pale between a branch of laurel and another of Cypress in Saltire all proper and in an Escrol over the same this Motto, "Altera Merces". John Sandford Fleming MacLean, Jr. Arms: Quarterly, 1st, Argent, a rock Gules, 2nd Or, a dexter hand fesswise couped Gules holding a cross crosslet fitchee in pale Azure, 3rd Or, on sea undy Azure and Argent a lymphad sails furled oars in saltire Sable flagged Gules, 4th Argent, in chief two eagles' heads respectant erased Gules beaked and eyed Azure, in base a salmon naiant Proper, overall a cross raguly Sable charged at the centre with a maple leaf and in chief and in base with two fleurs de lys Or and in the flanks with two salmon naiant Argent, a bordure indented Vert. Matriculated: Grant and subsequent Matriculation February, 2005. Coat of Arms of Lauchlan Macleane 1727-1778 (born Laughlan Mclean). (Taken directly from "First Anual Gathering of the Clan MacLean Association of North America" by J. P. MacLean). Coat Of Arms. - Sir Hector MacLean, Chief of the MacLeans, and ancient loyal, potent clan, in the Highlands of Scotland, of which there have been many brave men. The achievement of the Family of MacLean, as illuminated in the Book of James Espline, Marchmount Herald, 1630, has four coats quarterly: 1st, Argent, a rock gules; 2nd, Argent, a dexter hand fessem ways coupled gules, holding a cross, crosslet fitched in pale azure; 3rd, a lymphad sable; 4th, Argent, a salmon niant proper, and in chief, two eagles heads waged affronted gules. Crest: A tower embattles argent. Motto: Virtue Mine Honor. Which achievement is represented standing on a compartment representing green sand and sea - out of the last issueth two selches proper for supporters. Donald McLean, who was born in Creich on the Ross of Mull in 1786, and emigrated to Quebec in 1829, where he settled in Lochaber and Thurso. It was to Donald that Lord Lyon granted the original arms. The blazon is: Quarterly, 1st, Argent, a rock Gules; 2nd, Or, a dexter hand fesswise couped Gules holding a cross crosslet fitchee in pale Azure; 3rd, Or, on a sea undy Azure and Argent a lymphad sails furled oars in saltire Sable flagged Gules; 4th, Argent, in chief two eagles' heads respectant erased Gules beaked and eyed Azure, in base a salmon naiant Proper, overall a cross raguly Sable charged at the centre with a maple leaf and in chief and in base with two fleurs de lys Or and in the flanks with two salmon naiant Argent, a bordure indented Vert. 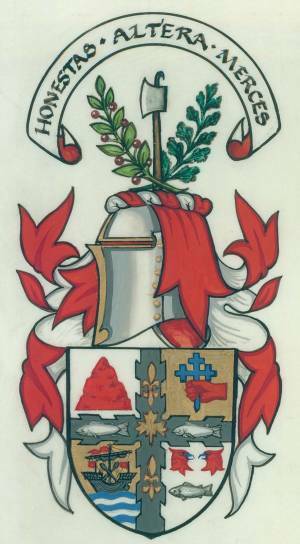 Above the Shield is placed an Helm befitting his degree with a Mantling Gules doubled Argent, and on a wreath of the Liveries is set for Crest a Lochaber axe erect in pale between a branch of laurel and a branch of cypress all Proper, and in an Escrol over the same this Motto "HONESTAS ALTERA MERCES"